The Economic and Financial Crimes Commission (EFCC) yesterday in Lagos arrested the former Managing Director of Bank PHB, Mr. Francis Atuchie, and a stockbroker, Mr. Peter Ololo. The EFCC's Spokesman, Mr. Femi Babafemi, told the News Agency of Nigeria (NAN) that the two men were picked up early yesterday by the commission's operatives. He declined to give any information on where the officials were detained in Lagos and when they would be charged to court. 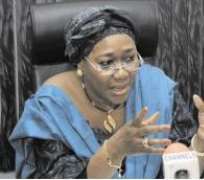 NAN gathered that Ololo was arrested in connection with an alleged N4.6 billion debt owed Bank PHB by Petosan Oil and Gas Company, suspected to be owned by him.Babafemi said the EFCC Chairman, Mrs. Farida Waziri, was in Lagos on Thursday to discuss with the commission's operatives on how best to tackle the new debtors. NAN reports that Waziri, accompanied by some operatives, was in Lagos to arrest some of the new debtors, whose names were released by the CBN on Wednesday.